A world-class artist, Lana Gomez has made a name for herself as one of the A-list painters in America. She is also best known as the wife of the renowned comic artist, Sebastian Maniscalco. Aside from gaining prominence as a top artist, Gomez has also acquired a tremendous fortune from her amazing artistry and has gone on to invent her own showroom in West Hollywood. Following her phenomenal artistic ability, Gomez’s artworks have made appearances on notable journals such as Instyle, The New Yorker, Vogue and also in Kelly Wearstler’s book Hue. Read on as we uncover more facts about the dexterous painter. Sebastian Maniscalco’s wife was born in Naples, Florida, the United States of America on 23rd April 1983. Her parents are Barry Gomez and Simone Lutgert Gomez. She has two siblings, Heather Dockweiler and Rodney Weiss. She is of Spanish-American ethnicity. Gomez completed her higher education from the University of Tennessee where she studied Art. Since her early years, the skilful painter has had a very strong interest in drawing and painting. As a result of this, Lana Gomez made the decision to pursue a career in fine arts. Upon her graduation from the university, the notable artist relocated to Los Angeles where she started creating beautiful artworks through her acrylics experimentation and the elaborative combination of various kinds of elements. Following her hard work and great determination for success, Gomez’s works subsequently captured the attention of the renowned interior designer, Kelly Wearstler, which led to their collaboration. During that time, Lana Gomez gained a spot at the design studio of the interior designer and there, she worked on their mural-sized piece. Interestingly, the top American painter’s work eventually made an appearance on Kelly Wearstler’s book, Hue. Also, her works have gone ahead to feature in multiple art galleries. In addition, Gomez has moved on to make a gorgeous display of her works in her showroom located in West Hollywood. Apart from her showroom display, her body of works has also been featured on several journals including Vogue, along with several other magazines. The beautiful artist, however, has attained much publicity through her creation of the gigantic 10-foot guitar sculptures situated in Guitar Town, West Hollywood. As a result of her exceptional creation, her works have captured the attention of a wide audience, which makes them rampantly seen in offices, residential homes and most notably, being starred in the iconic Greystone Mansion in Beverly Hills. The talented painter is married to Sebastian Maniscalco who has gathered much fame as a comedian and actor. He runs a podcast titled, The Pete and Sebastian Show alongside his friend, Pete Correale. He further works as an on-air host of Sirius XM radio program called Raw Dog comedy. As an actor, Lana Gomez’s husband has starred in The House and the Academy Award-winning movie, Green Book. The couple is reported to have met for the first time in a gym as they were under the same personal trainer. Almost soon after, the pair began dating and eventually solemnized their union on 26th August 2013. They have a daughter named Serafina Simeone Maniscalco, who was born in April 2017. Gomez and Maniscalco are happily married and love staying in each other’s arms as they frequently share their loved-up pictures on social media. Following the publications of her captivating artistic works on magazines such as Los Angeles Confidential, The New Yorker, among others, Lana Gomez clinched the Tastemaker of 2014 award by California Home and Design Magazine. The notable artist and her husband bought a luxury home in 2014. The beautiful edifice was totally decorated by the famous interior designer, Kelly Wearstler. The talented painter’s biological father, Barry Gomez died in 2001, resulting to her mother’s second marriage to Scott Lutgert in 2003. Lana Gomez’s mother and stepfather live in Naples, Florida. 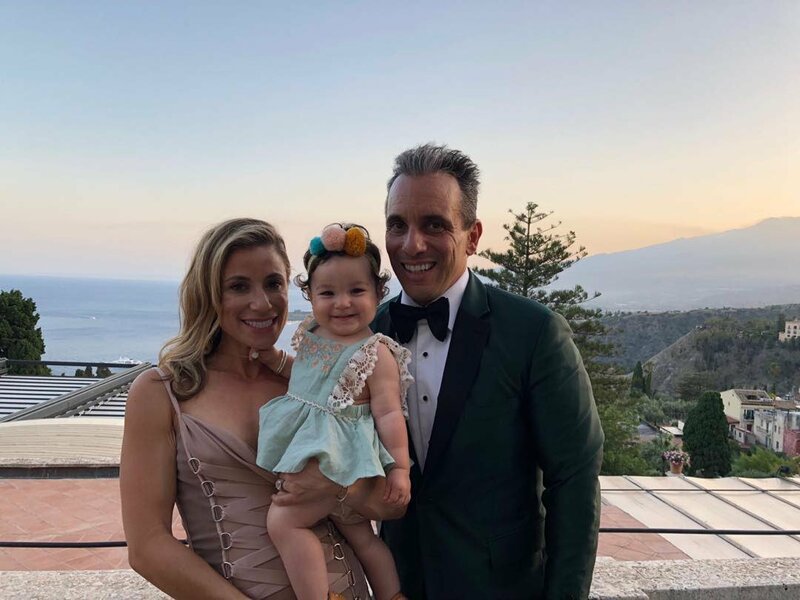 Sebastian Maniscalco’s wife loves to travel with her husband to his multiple comedy shows and she often receives special recognition from Maniscalco during the show. Lana Gomez gave birth to her lovely daughter in 2017, and she was named Sarafina Simeone Maniscalco. The name Serafina can be traced to Sebastian Maniscalco’s grandmother while Simeone is the name of Lana Gomez’s mother.